Notwithstanding Himachal’s stiff opposition to the extension of industrial package and its claim in BBMB projects, the Haryana Government is not only keen to have cooperation with the hill state in the hydro-power and tourism sectors, but also favours an amicable settlement of vexed inter-state issues. About 10 more board employees are likely to be arrested in the examination scam. The sources available here told The Tribune that the arrests were likely to be made in the next few days. The Haryana Government is legally examining the report of the committee set up regarding the issue of a separate Shiromani Gurdwara Parbandhak Committee (SGPC) in the state. It was once again an all-girls affair with only one boy making it to the top 10 positions in the B Sc-III result which was declared by Himachal Pradesh University here today. 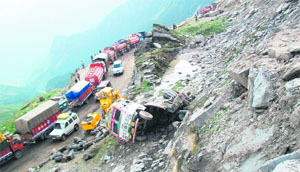 Hit by a labour crunch and the movement of heavy traffic, the Border Roads Organisation (BRO) has failed to stabilise the 200-m-long landslide at the Rani Nullah and maintain the 30 km-long Marhi-Rohtang-Koksar stretch and the 15 km-long Gondla-Tandi-Keylong stretch for the past two years. Facing criticism over the proposed closure of schools under the rationalisation scheme, the government has decided not to wind up any of the 778 institutions having very low enrolment, and instead merge and convert these into branch schools. The Irrigation and Public Health (IPH) Department will soon install tube settler in the Beas, from where drinking water for Hamirpur town is drawn, by end of the next month, to improve the quality of water by eliminating silt particles from the water through purifying. As part of its strategy to strengthen the sinking Ridge and surroundings area, the Shimla Municipal Corporation (MC) has moved a case for the construction of a commercial complex right from the Lakkar Bazaar bus stand uptil the Ridge. The information furnished under the Right to Information (RTI) Act by the Raj Bhawan that the office of the Governor was not aware of any “cash on camera” video CD featuring a BJP MP from the state had caused much embarrassment to the Congress, which had submitted a memorandum to Governor Urmila Singh demanding a CBI probe in the matter. “We opposed incentives to boost industrial growth in Himachal, but the Centre must provide a similar dispensation to backward areas of Haryana, particularly Mewat and Morni, which lagged far behind in industrial development like the hill areas. The Central polices must ensure a level playing field, but the grant of industrial package only to Himachal and Uttarakhand and not other backward pockets of the region has led to flight of industry from the neighbouring states”. 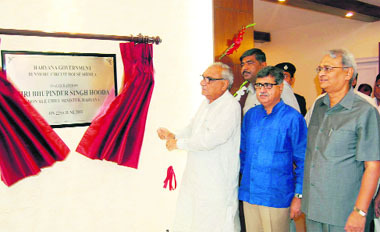 Haryana Chief Minister Bhupinder Singh Hooda said this while clarifying the state’s stand on the issue here today. The Haryana Government would prefer an amicable settlement on the issues under the Punjab State Reorganisation Act regarding which Himachal had already filed a case in the Supreme Court. However, an amicable settlement could be arrived only if the interests of the stakeholders were safeguarded, Hooda told mediapersons after inaugurating the Benmore Circuit House, which reopened after a major renovation costing Rs 1.49 crore. So far as the Renuka Dam Project is concerned, it was a national project and the states concerned had agreed in principle, but the negotiation process was on. Referring to mutual cooperation in hydro-power and tourism, he said a suitable initiative should come from Himachal Pradesh. In fact, a common tourism circuit was already being developed by the two states and Haryana would welcome more tie-ups in the sector. The state was keen to collaborate in the hydro-power sector, though it had done exceptionally well in augmenting the installed generation capacity by 5,000 MW with four new power plants. While thermal plants at Yamunanagar and Hisar had become operational, two more plants with aggregate capacity of 2,820 MW would be commissioned shortly in the Jhajjar district making the state self-reliant. Asserting that Haryana never lagged behind in providing road connectivity to HP areas, he stated that the main traffic bottleneck would be removed when the Kalka-Pinjore bypass would become operational by December. 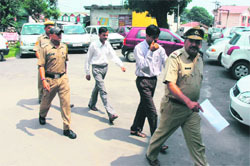 SP, Kangra, Diljeet Thakur admitted that some more arrests of board employees would be made in the coming days. He said the police had completed investigation in the case. The employees who had been arrested had been found to be directly involved in the scam. The chargesheet in the case would be submitted as soon as the report from the Forensic Department was received, the SP said. The answer sheets of students who had passed the board classes without appearing in the examination centres had been sent for forensic examination. Forensic experts would give their opinion regarding the handwriting in the answer sheets. The reports would help the police establish the fact that students did not write in their answer sheets. Meanwhile, all the five accused board employees who were arrested yesterday by the police were released on bail today after they were produced in the court of the Judicial Magistrate, Kangra, today. The police, however, re-arrested two board employees Manohar Lal and Omkar in the case registered against them for helping students clear Class VIII board examinations. They were earlier arrested for connivance in helping Class XII students. The police has till date booked 208 students of Classes VIII, X, XI and XII and 40 board employees, teachers and private academy staff in the case. Police sources here said after investigation the board employees had been found to be directly involved in the case. The board employees had in their procession the absentee list of students from examination centres and lists of bundles that were sent from board to evaluation centres. However, they used to ignore the absentee list, the list of bundles sent for evaluation while preparing the results. The police officials said the logic given by board employees that they ignored the small number of absentees due to the large number of answer sheets coming to them during examinations was unfounded. Some board officials had been deployed particularly for purpose of checking these anomalies. But they overlooked the additional answer sheets coming to them, deliberately, that indicated their connivance with the main accused. Earlier, the board employees had resisted the arrest of their colleagues. The sources available here told The Tribune that the police went slow in the case in the past two months as the board examinations were being conducted. They apprehended that the conduct of examinations might be hit if the employees went on strike against the arrest of their colleagues. However, now that the result of all the board classes is out, the police is planning to file a chargesheet in the case very soon. Stating this here today, Haryana Chief Minister BS Hooda said the committee had submitted its report in favour of having a separate SGPC and further action would be taken after studying its legal implications. The government would go by the wishes of the Sikh community which accounted for a sizeable 3 per cent of the total population. Referring to the achievements of his government, he said the increase in the plan size from Rs 2,200 crore in 2005 to Rs 20,358 crore for the current year provided a good indication of the performance of the government on the development front. The PWD had spent Rs 10,327 crore in the past six years on development of infrastructure as against only Rs 2,334 crore during the six years of the previous regime. The state had achieved the highest per capita investment in the country, up from the 14th place in 2005, and it also ranked first in terms of per capita income after Goa. Haryana was set to become an education hub of international standards over the next five years with opening of six new universities in the state, including the country’s first defence university and a women’s university, and a large number of professional institutions like the IIM, and Central University. The state had protected the interests of Himachali students while setting up the five private universities by reserving 25 per cent seats, out of which 5 per cent students would be given full fee concession, 10 per cent 50 per cent and the remaining 10 per cent 25 per cent. The pass percentage of the examinations held in March is 94.88 per cent as 2,352 students out of a total of 2,479 were declared successful. Nitu Mahajan, a student of DAV, Kangra, emerged a topper with 85.9 per cent. Shivani, student of SVSD College, Bhatoli, stood second with 85.35 per cent. Deepika, also from SVSD College, Bhatoli, with 85.25 per cent, bagged the third position. Poonam, St Bede’s College, Shimla, stood fourth with 85.1 per cent followed by Garima Kumari of Government College, Mandi, with 83.57 per cent. Ankita Sharma also from Mandi College bagged the sixth place with 82.97 per cent followed by Indu Bala from Government College, with 82.75 per cent. Chandrani Thakur from Mandi College stood eighth with 82.32 per cent, while Pankaj Kumar was the lone boy to make it to the top 10 positions in the merit list. A student of Daulatpur Chowk college scored 82.15 per cent while Nisha Sharma of Government College, Sanjauli, got 81.7 per cent. While the hard-earned money of taxpayers is going down the drain, it has turned the traffic on this part of the high-altitude highway all the more hazardous for Leh-bound tourists and locals going to Lahaul and Leh. The BRO claims it spends Rs 7 crore or Rs 10 crore per km for the double-lane highway and Rs 100 crore on the maintenance and snow clearing on the Manali-Serchu highway every year that comes under the Deepak project, said sources. Accidents are a common sight on this road. Five tourists, including a foreigner, were injured after the tourist vehicle they were travelling in fell into the nullah near Keylong on Sunday. In another incident, a truck carrying charcoal drums fell down near the Rani Nullah. Travelling from Marhi to Rohtang and further down to Koksar and between narrow slushy stretch between Gondla and Tandi and between Keylong and Stingri in Lahaul is both uncertain and risky. It takes 12 hours or a whole day to reach the destination as vehicles continue to remain stranded at the Rani Nullah for hours daily in the past year. The Marhi-Koksar road stretch is littered with potholes and sharp boulders. The pools of water melted from the glacier have turned this stretch of the highway look like a flood-ravaged stream. There are no culverts and drains that allow the melted water to flow freely on the road. Overloaded trucks continue to ply on the highway on the bridges designed not to carry a load of over 10 tonnes. But oil tankers carrying fuel supplies to Leh carry a load above 20 tonnes or more. Though BRO in-charge of this stretch AV Singh claimed that they had deputed over 250 labourers and 10 machines between Koksar and Marhi both sides of the Rohtang Pass, this correspondent spotted not over 100 labourers and six machines, three deployed at the Rani Nullah. The administration used to close the Rohtang Pass every Tuesday allowing the BRO to repair the trouble points, but there is no respite from the traffic, rued Singh. The BRO has 250 labourers while it needs 1,000 more to meet its deadline. Expressing his helplessness, AK Dikshit, BRO commander of the Deepak Project, said they needed more time to maintain the road stretches due to the heavy traffic. Dikshit claimed that they would blacktop the Marhi-Koksar stretch by March 2012 and complete the doubling of the Manali-Serchu highway by 2015. Stating this at a press conference here today, Education Minister ID Dhiman said under the scheme, primary schools with less than 10 students, middle school with less than 25 and high schools having up to 40 students were to be closed. However, these would be temporarily merged with neighbouring schools or continue as a branch of the neighbouring school. Accordingly, the rationalisation exercise in five districts had resulted in the merger of 166 schools and another 50 schools had been made branches. In all 382 underutilised teachers had been spared. These schools would be revived as and when enough students were available. He said the state had done exceedingly well in elementary education and literacy as was evident from the fact that its school dropout rate was just 0.3 per cent, the lowest in the country, and literacy rate of 83.78 per cent, next only to Kerala. The study conducted by an independent agency, Pratham, showed good academic standards with an achievement level of 77.5 pc in mathematics as compared to 54.90 pc at the national level and 81.60 pc in languages, compared to 64 pc in rest of the country. While the craze for English medium attracted students to private institutions, low enrolment in government schools, which had better qualified staff, dissuaded them. The rationalisation exercise would take care of the low enrolment issue to an extent. Besides, the government had decided to introduce computer education in more schools and had recently decided to recruit 970 lecturers in computer science for the first time. The objective was to make computer education compulsory, along with English and Hindi, in a phased manner. In all, sanctions had been granted to fill 5,000 posts of various categories of teacher.aThe Budget for education had almost been doubled from Rs 1,497 crore in 2007-08 to Rs 3,165 crore in 2011-12 and the entire effort was now focused on consolidation rather than expansion. Infrastructure was being created in a phased manner and scholarship schemes had been started to help poor students. This was stated by Rajesh Bakshi, Superintending Engineer (SE), IPH Circle, Hamirpur, while sharing achievements of the department with mediapersons here today. He said: “The quality of drinking water is not that good due to heavy discharge of silt in the Beas from the Pandoh Dam, but we are making efforts to purify it”. “Through the tube-settler method, 80 per cent problem of silt in drinking water would be solved,” he said. The SE said, “For effective chlorination of drinking water in Hamirpur town, the IPH Department is starting a gaseous chlorination to purify it by maintaining steady chlorine contents”. He said, “Due to sporadic rains, this summer there had been no shortage of water in the area and no tankers had been deployed to supply drinking water”. Under the Mewa-Bamsan-Lagwalti Drinking Water Scheme, the department was supplying 84 lakh litres drinking water daily, while 51 lakh litres was being supplied to Hamirpur alone on daily basis, he added. He said 2,671 hand pumps had been dug in different parts of the district. The IPH department was working on sewage schemes in Hamirpur, Sujanpur and Nadaun towns and the work on the Hamirpur scheme would be completed by June 2012. Several new drinking water schemes and irrigation projects were also being implemented in the district. Hamirpur DC Rajinder Singh Thakur asked the IPH Department to redress the pubic grievances on priority basis. Executive Engineer, Hamirpur, SK Dhiman, and Executive Engineer, Badsar, Dharmender Gill, were also present on the occasion. The MC has submitted the proposal before the Infrastructure Development Board so that the project can be taken as part of the long-term and permanent measures to stabilise and strengthen the Ridge, which has been sinking and posing threat to the entire area on the Rivoli side. The project will also ensure the construction of a modern bus stand with all the amenities below Rivoli cinema and connect it to the Ridge with the help of elevators and a lift. The entire stretch from the Ridge, including the Tibetan market, Rivoli theatre, Sood Janjghar and bus stand, will be part of this big complex having over 20,000 sq m area. The reports by experts from the Geological Survey of India and the Geological wing of the State Industries Department had suggested the construction of a structure which would fill up the gap. “We have moved the case before the Infrastructure Development Board as the construction of a commercial complex is the only solution for strengthening the Ridge as a permanent measure,” said AN Sharma, Municipal Commissioner. He said temporary measures had been taken to prevent further sinking, but ultimately a structure had to be raised to stabilise the area. He said talks had been held with all the stakeholders and everyone had agreed for the construction of the complex. The 103 shopkeepers, including 72 Tibetans who are presently running their shops in sheds on the road linking the Mall to the Lakkar Bazaar bus stand, would be given shops in the complex. The MC was keen to shift all the shops, but the Tibetans moved the court and the matter was still pending. The project is likely to cost over Rs 250 crore and taken up under private public partnership (PPP). “The consultant will also suggest the economic model to be adopted as the shareholders will have to share the cost of construction,” the Commissioner said. Another positive aspect of the project is that the haphazard and congested Lakkar Bazaar bus stand, from where all buses to Upper Shimla emanate, will also be modernised and facilities for passengers created. Pradesh Congress Committee chief Kaul Singh and Leader of the Opposition led the party deputation to the Raj Bhawan and submitted a memorandum to the Governor on March 10, 2010. Thus, the response of the public information officer of the Raj Bhawan that the matter was not in the knowledge of the Governor had come as an embarrassment to the party. 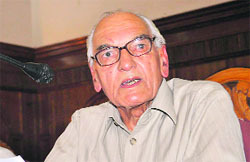 Kaul Singh said he would meet the Governor and find out the truth behind the information provided. The information was usually provided by the designated officers and he would take up the matter personally. RTI activist Dev Ashish Bhattacharya had in his application sought information whether the incident was in the knowledge of the Governor’s office and, if yes, what action was taken in the matter. Also, if the Speaker of the Lok Sabha was informed about it. The Public Information Office (PIO) of the Raj Bhawan had initially transferred to the application to the Home Department of the government. However, Bhattacharya filed a complaint with the State Information Commissioner emphasising that only his queries pertained to Governor’s office and action taken by it and it was wrong to transfer the application. Thereafter, a reply was given to the registrar of the commission and a copy of it was sent to him. The PIO stated that he had checked from all officials concerned and there was no correspondence available with the office pertaining to the incident.